Event Aggregator allows you to import events from other sources, including Google Calendar, iCalendar, Meetup and Eventbrite, as well as from ICS and CSV files. This article covers the step by step process for importing from another site using a feed or URL. Separate tutorials explain the process for importing from a CSV file or ICS file. Before you can import from one of these sources, you'll first need to have a valid license for Event Aggregator entered under Events > Settings > Licenses. You'll then see the import options available under Events > Import. Click the Import Origin dropdown and select the source you are importing from. ICS File: a file type which contains iCalendar data. Importing from an ICS file is covered in this tutorial. Select the source you wish to import from, and the next set of options will appear. The first time you import from Meetup, you'll be prompted to enter some information which allows Event Aggregator to "talk" to that source and accurately gather event data. You connect to these sources from the New Import screen or by going to Events > Settings > APIs. The instructions for each application will be provided on the screen with direct links for where to find them. You'll need to login to your account on Meetup.com. The first time you import from Eventbrite, you'll be prompted to log in to Eventbrite and then allow Event Aggregator to connect with your Eventbrite account. This will allow Event Aggregator to "talk" to that source and gather events data. You can also review your connection by going to Events > Settings > APIs. Will this be a one-time, manual import of events or a repeating import that runs on a schedule? This step allows you to choose the type of import you need. If you select Scheduled Import, you will need to specify how frequently (daily, hourly, etc.) 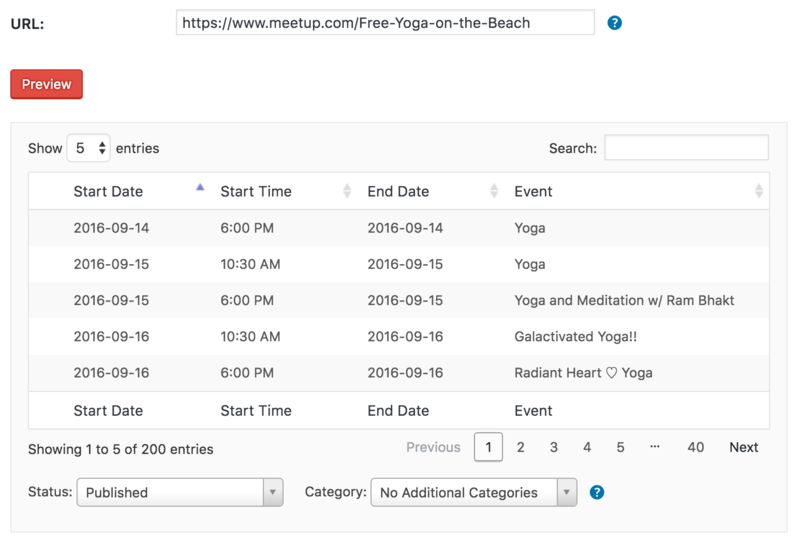 Event Aggregator looks for new or updated events and runs an automatic import. The first import will run immediately, and then on its set schedule. Provide the URL of the source that your events are being imported from. For example, if you have selected Meetup as the import source, then you will provide the URL of the Meetup group where the events being imported are located or the url of a specific event. If you are not sure what url to use, click the icon to read detailed instructions for the source you're using. If you are importing from iCalendar or Google Calendar, you have the option of filtering the events feed. This is particularly useful for feeds with a very large number of events, especially if you are only interested in certain types of events. Click the "Preview" button and Event Aggregator will produce a list of events that are available to import from the source your provided. This preview shows you all the events available to you in the feed. It provides you with a chance to search for specific events, select only the events you want to import, or simply check the content before everything is imported. Once you've had a chance to preview your content and select what you would like to import, go ahead and click the Import All/Save Scheduled Import button below the preview panel (the text of the button is different for one-time imports and scheduled import). Click the button to start your import, and then sit back and watch Event Aggregator do the work! Please note that Event Aggregator does not detect when an event that was imported in a previous import has been deleted at the origin, event if you re-import from that origin again. So even if you imported an event from an iCalendar feed and it was later and removed from that feed, a second import of that feed will not delete the event from your WordPress site. If you need to track cancelled or deleted events and you control the origin/source calendar, the best strategy is to mark a cancelled event as cancelled or deleted in the event title instead of actually trashing the event. That way, when you re-import the source feed, the event can be updated in your WP calendar with the cancellation note. You could then choose to delete the event on both calendars, or simply leave it with the cancelled notice.